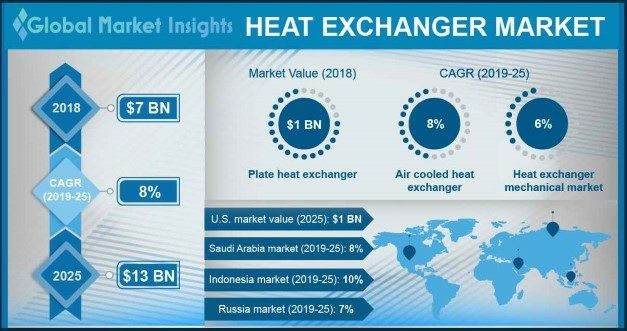 Heat Exchangers Market size will surpass USD 13 Billion by 2025, as reported in the latest study by Global Market Insights, Inc. Rising demand for centralized heating & cooling across the commercial and residential sector will drive the heat exchanger market size. The increasing installations of WHRS across the industrial sector will further complement the business growth. Shifting regulatory landscape to curb carbon emissions on a global scale will thrust the deployment of heat transfer equipment. Middle East & Africa heat exchangers market is set to witness gains over 7% by 2025. Resurgent economic growth along with rising investment from financial institution including African development bank toward industrialization have stimulated the installation of these units. The region is characterized by the robust oil & gas sector, where heat exchangers play a crucial role across the value chain. Positive outlook toward expansion of manufacturing sector on account of increasing investment will further boost the product penetration in coming years. Shell & tube heat exchanger market size will grow on account of its ability to offer low pressure drop, high efficiency and low cost. Primary metal manufacturing, oil & gas, food processing and electric power plants are some of the significant application areas where these systems are installed. Growing adoption of heat recovery systems across industrial sector along with rising investments toward expansion of chemical production facilities will stimulate the business growth over the forecast timeframe. Robust industrial sector growth along with stringent government regulations to reduce carbon footprint will drive the heat exchanger market. Key economies have introduced carbon emission reduction targets to counter the adverse effects of global warming resulting in increased investment toward replacement of existing process equipment. The positive outlook for chemical sector along with increasing investments for generating capacity additions will further boost heat exchanger installations across the globe. China heat exchangers market size will witness growth on account of government focus toward development of new industrial centers along with upgradation and expansion of existing manufacturing facilities. The region is rapidly emerging as a manufacturing hub and currently accounts for over 50% of the global manufacturing value added. Growing urbanization coupled with increasing investment toward oil & gas, metallurgy and chemical sector will positively influence the heat exchanger market growth in coming years. Heat exchangers have found high penetration across centralized heating & cooling, chemical, refining, food & beverage, petrochemical and power generation industry. The growing eminence of energy optimization across the food processing along with increasing investments for the upgradation and development of new industrial infrastructures will significantly contribute toward heat exchanger market growth. Ongoing technological advancements resulting is highly efficient and low-cost heat transfer solutions will further complement the industry growth. Eminent industry participants in heat exchanger market include Kelvion, Southern Heat Exchanger, API, Danfoss, Vahterus, KNM, Wessels, Koch, Thermofin, Larsen & Toubro, Lanpec, Doosan, Shandong Beichen, HRS, Hitachi Zonsen, THT, Accessen Group, SWEP, Hisaka Works, IHI, Thermowave, SPX-Flow, Xylem, Alfa Laval and FUNKE.